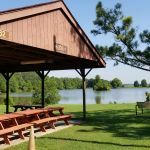 Ask fellow campers about "Maxwell-Gunter AFB FamCamp (Military FamCamp)" and nearby attractions. The only reason I did not give it a 10 is the closeness of the sites. I was not comfortable with that. Otherwise this is a wonderful campground. Great pull through pads with level concrete and well planned hookups. An older section has shade. The manager was kind and helpful. The walking path around the lake is peaceful and pretty. The lake looks like a great fishing hole but I didn't wet a hook. 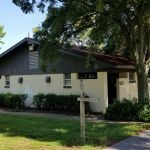 There are grassy open areas to let your dog run, but officially must be on lease. The camp is isloated on the west side of the base but the BX and Shopette are minutes away. The camp stays mostly full. There are a lot of TDY and contractors camped here. Reserve early. 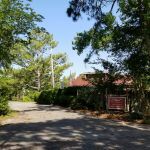 We camped at Maxwell-Gunter AFB FamCamp (Military FamCamp) in a Travel Trailer. Spent 3 nights. Limited to those associated with military. Enjoyed our stay. Helpful staff. Concrete pad with long enough pull through that we could have stayed hooked up with our 34' fifth wheel if we had wanted. Full hookups. Sites are pretty close together and camp was full. Lots of long term residents attending training on base. Near runway but aircraft noise not an issue due infrequent flights. Occasional train whistles but nothing like USAFA for those who have stayed there. Good camp. We camped at Maxwell-Gunter AFB FamCamp (Military FamCamp) in a Fifth Wheel. Kelly gate near the RV Park is often closed or limited requiring using the main gate which is Maxwell gate/Maxwell road. For those not familiar with the base it's easy to take Maxwell to the end and turn left on Kelly. Right before exiting the base at Kelly gate (and I mean right before - like a few yards before) take the right that leads across the airfield to the camp. It's a rough road especially on the turns so go slow. After reading some of the reviews I was a little nervous about staying here. Needless to say I was pleasantly surprised. 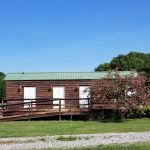 This is really a nice campground and extremely affordable. Even though I was in a full sun site, when it appeared that shaded sites were available, it was still nice. All the sites are paved with sewer hook ups and water. The grounds are well taken care of. The laundry room was convenient and pretty clean. There was plenty of room to run my dogs and a dog park. The campground is located on the opposite side of the airfield but rest assured it's not noisy. We only heard the planes once in our 5 day stay. The only thing that's annoying is the train that comes through around 4 or 5 am and blasts their whistle for what seems like forever. Other than that, this was a great campground. We camped at Maxwell-Gunter AFB FamCamp (Military FamCamp) in a Fifth Wheel. It's easiest to come through the Kelly gate. You can't make the immediate left to head towards the campground but they do have a turn around to the right for bigger vehicles. Must be military, active retired ....Was to stay 3 days, ended staying 14. Had air brake problem. Host was very understanding, and extended stay with no problem. Recommended Russel Trucking, which did fix my problem. Road in very rough. Used PX Commissary and class 6 (liquor). Good for a few nights while passing thru. We camped at Maxwell-Gunter AFB FamCamp (Military FamCamp) in a Motorhome. Not much around. PX, commissary and class 6 best to go to. This was our third stay in a military base. As is typical, it was tucked in the farthest possible corner of the base. However, if you trust the signs, you will find it. GPS is not helpful. Sites were level, power and water were satisfactory. The only negative aspect was the lack of mowing of the dog walking area. I was wet almost to my knees from morning dew and walking the dog. We stayed her due to mechanical difficulties, and would stay here again. We camped at Maxwell-Gunter AFB FamCamp (Military FamCamp) in a Motorhome. No one in camp office on weekends. Park is on the other side of where you have to enter base on the weekend. Nice size lots with easy leveling. Concrete. Ever sction has no trees. We camped at Maxwell-Gunter AFB FamCamp (Military FamCamp) in a Motorhome. Quiet hours at this park are from 10pm-7am. It is now after 11pm and one of my nearby neighbors (a homesteader) has been blasting his stereo inside his motorhome for the past 3 hours. I don't know how the people in the RVs next to him stand it. We're here overnight and our stay cannot end soon enough for me. I hope to get at least a decent night's sleep. No one is around to enforce quiet hours and it's apparent the permanent residents here know that and take advantage of it. We made reservations yesterday and were assigned a site, #52. When we pulled up to the site, someone was already parked there. They were overnighting too and hoping we would be a no-show. They left and found a different site. As we were hooking up our utilities, we noticed the resident in site #51 next to us had strapped his satellite receiver to the top of the grill on our site. We asked him to remove it and he asked if we were using the grill right then. We insisted he remove it and he came out 15 mins later and grudgingly did it. The park is full of homesteading residents with all their stuff spread out around their rigs and spilling over to the empty sites (like the satellite receiver I mentioned earlier). There's a definite trailer park feel to this place. Many sites are so close together, you can hear your neighbor yawning (as we did). The cement pads are nice - long and level. Hookups are in the middle. Water pressure is in the red zone so use pressure regulator. WiFi is non-existent and there's no cable. There's trains passing nearby. And neighbors who play loud music late into the night. I can't wait to leave and never return to this trailer park. We camped at Maxwell-Gunter AFB FamCamp (Military FamCamp) in a Motorhome. This is a typical military campground with a number of semi-permanent residents who apparently have business on the base. Although it is an Air Force base, airplane noise is not a problem. 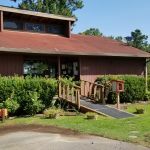 The park and facilities are clean and well maintained and the hosts are friendly and helpful. The only thing we wished for was a dog park but there is a lot of open spaces for dogs to run. Just have to be on a leash. Sites are concrete pads closer together than usual on a military rv park, but not a problem for us. 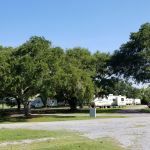 We camped at Maxwell-Gunter AFB FamCamp (Military FamCamp) in a Fifth Wheel. Downtown Montgomery has a number of good places to eat. If you like good old fashioned Southern cooking, try Martin's on Carter Hill Rd. We stayed for a night passing through. We were placed in the newer section of the park at a nice long pull thru with cement pad. The park is very nice and seems to be kept up. However there are quite a few long term residents that have lots of stuff around their sites that to me makes it feel like a trailer park. Site was level, close to neighbors but not on top of each other. No cable, but plenty of over the air channels. WiFi was pretty much useless. They recommend using a water pressure valve, which we did along with our filter and pressure was still good. A very nice park that we would like to see in the summer with all of the available gear rentals by the lake. Only heard one plane during our stay so can't complain about the noise. However we did hear quite a few trains during our short stay. Laundry was 75 cents per wash and dry cycle. We would definitely return. 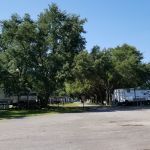 We camped at Maxwell-Gunter AFB FamCamp (Military FamCamp) in a Fifth Wheel. Overnighted here in route to Orlando. Lots of long term campers attending the Air War College and other courses on post, gave it that homey military feel. Showers are newer shower trailers you would encounter on a deployment, but very well maintained. Two large playgrounds nearby for kids. Con - mosquitoes off of the pond and soccer fields across the road will probably draw in crowds on game days, i.e. Saturday mornings. We camped at Maxwell-Gunter AFB FamCamp (Military FamCamp) in a Motorhome. We camped three days and enjoyed every minute. This is a clean and well-maintained camp. Twenty local television stations. Very strong WiFi. Super nice laundry. Friendly staff. Campsites are level and full hookups are convenient. Beautiful lake and trails. Verizon service was excellent. Only negative is there is a paper mill several miles away and if the winds are strong there is a slight unpleasant odor at times. Also, there may be military aircraft in the area. But, for military folks this is the sound of freedom. 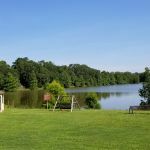 We camped at Maxwell-Gunter AFB FamCamp (Military FamCamp) in a Travel Trailer. Enter via the Kelly Gate and immediately turn left. This takes you directly to the camp. Nice and clean facilities! Washers and Dryers very reasonable--$1.50 wash&dry per load. Cement, level sites. Site Manager polite and friendly. Will stay here again. We camped at Maxwell-Gunter AFB FamCamp (Military FamCamp) in a Motorhome. We stayed here for 2 nights passing through from Nashville to Pensacola and it was a good stay. The camp was easy to get to and a perfect stopping point. We liked the covered patio area and the private shower areas. Plenty of space to walk the dogs and the camp host was welcoming. We will stay here again. 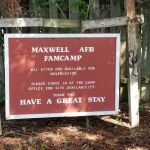 We camped at Maxwell-Gunter AFB FamCamp (Military FamCamp) in a Travel Trailer. Very nice level pull through. Good as an overnight. We liked the security and quiet. Would return. We camped at Maxwell-Gunter AFB FamCamp (Military FamCamp) in a Fifth Wheel. Are you affiliated with Maxwell-Gunter AFB FamCamp (Military FamCamp) ?